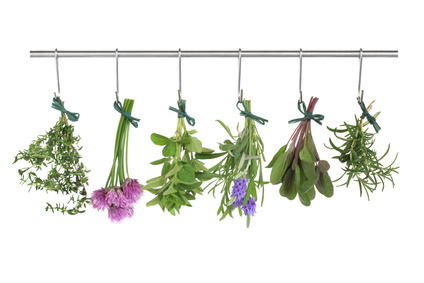 Whilst many people know the culinary uses of commonly sold fresh herbs I thought it would be good this month to talk about their medicinal qualities too. A word of warning though, do please ensure you have the specific variety to which I am referring – simply check the labels just to make certain. In the 1500s parsley (petroselinum crispum) was introduced into Britain as a renowned diuretic, digestive tonic and menstrual flow stimulator. Nowadays, Medical Herbalists still use it in these ways for their patients. Its also a very nutritive herb containing marked amounts of Vitamin C and Iron. Sage (Salvia officinalis purpurascens/rubia) has many uses making it an excellent herb to have to hand. Take a few fresh leaves and rub directly onto bites and stings as a quick anti-inflammatory first aid treatment. Make an infusion and use hot or cold – its antiseptic and astringent qualities may help as a gargle/mouthwash for throat and gum problems. Thyme (Thymus vulgaris) is another tasty common garden herb with medicinal actions. Its antiseptic and astringent properties make it a suitable accompaniment or alternative to sage in problems associated with the mouth and throat. Thyme is particularly renowned for its antiseptic, antispasmodic and expectorant properties explaining its use in coughs and other problems related to the lungs and respiratory system. It also has an anti-fungal action which may help such things as athlete’s foot, ringworm and thrush. Lavender (Lavandula officinalis) is recognisable to most of us and smells brilliant fresh!! Many people are surprised to hear it has medicinal value beyond its reputation for helping sleep. It is definitely worth trying the flowers infused as a tea, its taste is delicate and has a number of actions beneficial to health. The essential oil that gives lavender is wonderful scent has antiseptic, antibacterial and analgesic properties. Fresh flowers are calming to the nerves and are antispasmodic, helping with spasm and tension, both muscular and in the digestive system. Finally Rosemary (Rosmarinus officinalis) – a hardy woody herb with characteristic fragrant spiky leaves. Rosemary has antidepressant properties, is a circulatory stimulant and nerve tonic which means an infusion can be quite uplifting to the spirits. A pleasant tasting and caffeine free alternative to coffee perhaps? Its essential oil is carminative and antispasmodic, useful qualities again for digestive or muscular pain and spasm. Traditionally speaking, a rosemary infusion is used externally to help hair growth – understood maybe by its ability to improve circulation to the head and scalp. This may also explain its use for memory and concentration. Overall, it makes a pleasant drink hot, cold or luke warm – especially if you are feeling in need of uplifting and restoring. As with all herbal remedies please be sensible. 2 – 3 cups of an infusion per day using a teaspoon of herb should be sufficient for most peoples needs. If you are pregnant, breastfeeding or taking any other medication then please take advice from a Medical Herbalist prior to taking any remedies. Should you have any questions, or require a private one to one consultation then please do contact me.